Emmarene idolizes the great jazz singer Bessie Smith. But when she can't afford a ticket to Bessie's show in her hometown, she decides to go anyway and listen outside the tent. On the night of the show, Emmarene pokes her head through the tent so she can not only hear, but see the glamorous singer strut around in her feather boa. Soon, however, Emmarene notices some nefarious figures on horses, dressed in white sheets, carrying torches. The Night Riders, otherwise known as the Ku Klux Klan, have come to sabotage Bessie's show! No longer worried someone might catch her without a ticket, Emmarene bursts into the show to warn everyone of the Night Riders outside. While others cower in fear, bold and brazen Bessie marches right outside and confronts the men on horseback, not only scaring them off with her words, but with her powerful singing voice. "Find the story in history." This is a quote attributed to both authors Matt Phelan and Audrey Vernick when I asked them -- on separate occasions -- how teachers can help make research more appealing to students. So often we ask students to research for facts, figures, and statistics, but the truth of the matter is, there is more to research than facts. History is full of stories just waiting to be told, and how we research in school just doesn't seem to jive with how people research in real life. Real research compels a person to learn more. Not so much in school. Again, I'll use Audrey Vernick as an example. She writes both fiction and nonfiction picture books, and one of her most recent picture books, Brothers at Bat, was a story she found in her neighborhood that was just waiting to be told. 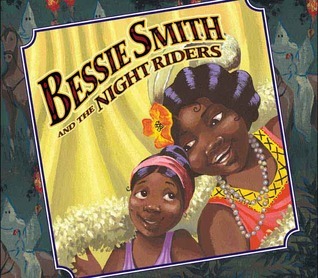 You get the sense that a story like Bessie Smith and the Night Riders was something that Sue Stauffacher happened upon while reading a Bessie Smith biography, perhaps that dedicated only a few paragraphs to the incident, but Stuaffacher decided that Smith's run-in with the Ku Klux Klan WAS the story and knew it deserved greater elaboration. What if we asked our students to research this way? To treat it as if they are searching for treasure? Find a topic you are interested in, "find the story" and then write it. I wonder what gems they might dig up. I'm already planning this as a research/writing assignment for my next classroom right now as we speak -- and I don't even have one yet.